uChicago is a pretty amazing approximation of Hogwarts, something I am reminded of and awed by every morning when I go to class. The main quad is the stuff of fairy tales. Tucked behind great towering buildings covered in ivy lie secluded chapels and corridors. You could easily get lost in the quad. It’s much larger than one would think, but broken up into quadrants- each ringed with gothic architecture. It is quite a sight to behold, especially after a storm, in the early dusk, when the clouds are rolling out only to reveal the darkening skies. That’s precisely the time when the photos that you are about to be being bombarded with were taken. Out exploring after a big lunch/dinner at the Med, I stumbled upon jaw-dropping lighting, which I could only amateurly capture. I wish I could have done it more justice, but I am still learning. Like everything else in this world, photography is a journey. And, um… I’m pretty early on in my journey. The photos of the cake- the chocolate gateau, as it were- were taken with a friend’s crazy nice lens (a 24-70mm f2.8, if I’m remembering correctly) and my T4i body. Talk about life-changing. This lens rocked my world and blew my mind. Seriously!! Remember how I invested in a macro lens merely a month or so ago? WELL I am so in love with this lens (and according to my actual photographer pals, this lens, or rather, one more appropriately suited to my camera body, is the way to go for my type of photography and interests) that I am promptly going to sell my (new) macro lens to buy a 17-55mm f2.8 EF-S lens. Unless, of course, one of you has one lying around that you’d like to gift me. The Hogwarts-esque photos were taken with a regular kit lens. Not that I’m giving excuses or anything, but I sure do wish I could’ve taken them with a slightly upgraded lens. Moral of the story: I’m just really greedy. Before I leave you to peruse the photos I have unceremoniously dumped at the bottom of this post, let me talk to you about this chocolate cake/torte/gateau. I knew I was going to make this post Hogwarts-themed, so I wanted something that was a tried and true Hogwarts dessert. Lo and behold, at the Welcoming Feast of the Triwizard Tournament (Harry Potter and the Goblet of Fire), chocolate gateau was served. According to the HP wiki, chocolate gateau is a flourless chocolate cake. I imagined it with a craggy top and lusciously fudgy interior. I found just the recipe and made the cake. It wasn’t quite as craggy as I had hoped, perhaps due to the very high pan that I used, but it was dramatic and intensely chocolaty and fudgy. During baking, it rises over the sides of the pan like a souffle, which is what gives it the beautifully fallen quality after having been removed from the oven. I was actually a little upset that my little cake didn’t collapse more. It’s a simple torte, one that gets all of its leavening from eggs, a quality which I adore for the texture it imparts. Use good quality chocolate. I used Callebaut 70% bittersweet, which helps to contribute to the deep and dark cocoa flavor. There isn’t much sugar, and I added quite a bit of salt, so the chocolate really shines. A more perfect accompaniment could not be imagined than lightly sweetened whipped cream. Eat the cake warm (nuke it if you must) with cold whipped cream (or even just pour a little chilled cream over the warm cake!) and you shan’t regret it. It is really quite heavenly. It’s the stuff of fairy tales. Oh, and P.S. if you like these photos, want to see more, or want to see them in higher resolution, head over to my flickr page in the uChicogwarts set! P.P.S. So I always thought it was Hoggy Woggy Hogwarts… but it’s Hoggy Warty. Grease a 6×3 inch springform pan. Combine the butter and chocolate in a bowl and microwave on low power until mostly melted. Stir together until completely melted and set aside to cool slightly. Place the egg whites in the bowl of a stand mixer with 50 grams of sugar and whip on high until stiff peaks form. Meanwhile, place the egg yolks in a bowl with 50 grams of sugar and whisk until pale yellow and doubled in size. Stir the vanilla and salt into the chocolate and butter mixture, then whisk the chocolate butter mixture into the egg yolks. Gently fold in 1/3 of the whipped egg whites, then gently fold in the rest, incorporating all of the chocolate/yolk mixture and all of the egg whites; batter should be homogeneous but still light. Pour into prepared pan and bake for 45-50 minutes, until a toothpick comes out with a few moist crumbs. Allow to cool slightly before removing from pan, then enjoy warm with softly whipped, barely sweetened cream! As some of you may know, yoga plays a huge role in my life. I practice 5-7 days a week. You could say I’m addicted. Yoga has shown me a part of myself that doesn’t need competition to thrive. Normally, I live for competing and comparison. In yoga, I am given the opportunity to learn to appreciate and grow with the people around me who are also sharing in the experience. Another beautiful part of yoga is the idea of self-study, which allows you to be both the teacher and the student, which is a unique and eye-opening experience. Leaving Ithaca meant leaving a studio which I had grown to not only love, but feel at home in. Mighty Yoga is not a yoga studio. It is a yogic community based on pure love; they welcome new students in with open arms and keep a place for returning students. I miss my Mighty Yogis something fierce. All of the teachers there are amazing and bring a different and new sense of wonder to the practice. I try to hold the sense of community and love that I received/receive from Mighty Yoga in my heart and mind as I try to set down roots in a new studio, which is a different community and a different vibe. Not bad, or worse, just different. 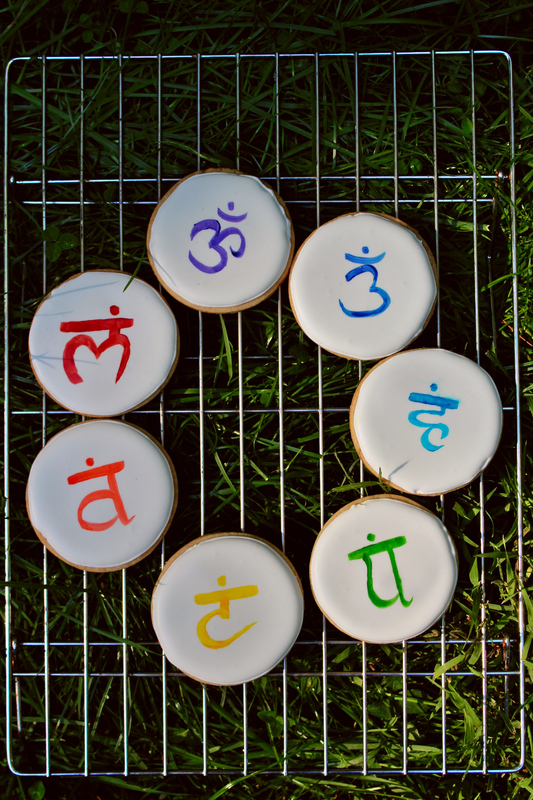 I made these hand-painted, chai-spiced and rosewater-frosted cookies as a goodbye gift for all the yogis at the studio. Buttery sugar cookies are dosed with cinnamon, cloves, nutmeg, and ginger, and the royal frosting is tinged with rosewater. They are delightfully crisp and equally buttery. I painted each with one of the seven chakras. P.S. Yes that’s me in the above photo… The pose is eka pada rajakapotasana II. Beat butter and sugar together until softened and pale yellow. Add in the egg and beat until super fluffy and shiny and not gritty, about 3 minutes. Add in the salt and vanilla extract and beat for 20 seconds. Add in all the flour and stir slowly, mixing until a homogeneous dough forms. It should not be overly sticky, nor should it be very crumbly. Roll it out to 1/4 inch thickness and cut it into shapes. Refrigerate or, even better, freeze, for at least 30 minutes while you preheat your oven to 350 degrees F.